At ARCK Foods we believe, "If you make the product correctly customers will seek that product and routinely purchase it again and again." 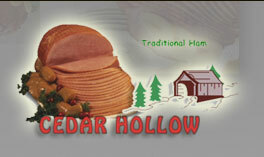 We are proud to offer superior ham products under varied labels, among them Cedar Hollow - Old Style Bavarian Ham, Brown Sugar Hams and Smoked Hams, along with several control and private brands. Our goal is that each ham produced is of the highest quality regardless of the label used. The management team's processing experience dates back to 1968 and continues today, still focusing on Quality Ham products & Food Safety for everyone's family!